With airlines charging extra for luggage these days, when flying to your embarkation destination streamlining what you pack can save big bucks. People who drive to the port have a little more leeway on what to bring, but some cruise lines limit the amount of luggage passengers can bring on board, so be sure to read your cruise documents or the info on the cruise line’s website so you know what and how much you are allowed to bring as well as what is not allowed on board. Airlines have issues with liquids in carry-ons, limiting size and quantity of bottles allowed. So for those not checking any bags, it’s good to know the ships usually have a basket of goodies waiting in the bathroom that includes samples of things like shampoo, hand lotion, and often a razor among other things. If there’s not enough to last the entire journey, just ask the stateroom steward for more. Hair dryers and irons take up a lot of space, don’t always work with the ship’s power source, and sometimes aren’t even allowed. While the ship’s hairdryer may be tucked away in an odd space like a drawer, normally each cabin has one. Luckily the ships often also have irons available for passengers to use. Carnival has one in each launderette. On other cruise lines you may need to ask your stateroom steward how to find one. Don’t waste space bringing beach towels or bathrobes, the ships provide those as well. 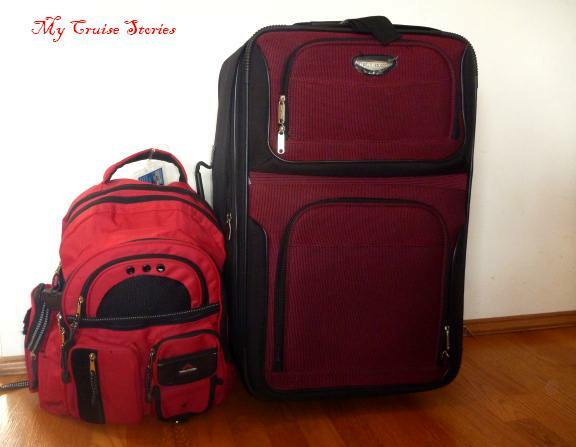 Packing items that can do double duty saves space over packing two different items. 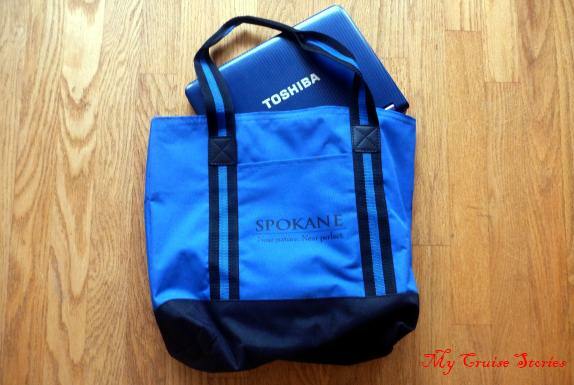 Carrying a laptop or netbook in a bag that can later be used as a beach bag on port stops saves packing a separate beach bag. Most ships still have formal nights, but at least on the cruise lines I have sailed with, black tie is not required. Check the dress codes for your cruise line because it does vary. The freestyle cruising on Norwegian means dressing up is totally optional even on formal nights there, while some other cruise lines may require things like collared shirts for men in the dining room every night. A skirt or pair of pants paired with a casual top and shoes for day use can work fine on formal night with fancy shoes and a nicer top. A sparkly tank top paired with a fancy sweater or dinner jacket can top off that skirt for formal night, and then wear the tank top with shorts other times to get more use out of it. Or use a fancy scarf to dress up an otherwise plain outfit for formal night. Scarves don’t take up much room and a nice hair clip such as Lilla Rose can double as a scarf clip. 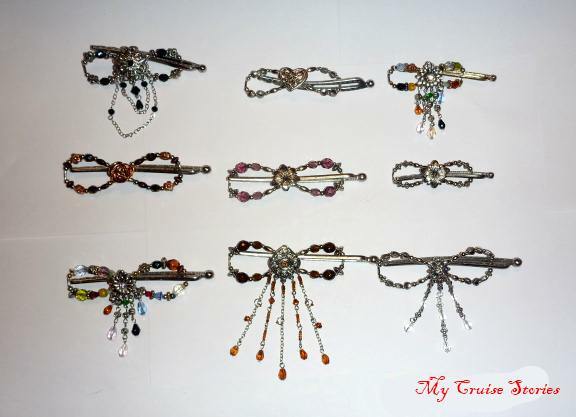 Speaking of Lilla Rose hair clips, they don’t weigh much or take up a lot of space so an assortment of sizes and styles of their totally awesome flexi clip is essential for me. My hair is sort of long, very thin, and babyfine. It never stays neat and will blow around into a tangly mess with the slightest breeze. So having these nice-looking easy-to-use clips onboard is pretty much a lifesaver, or at least a hair saver. They are practical enough to wear on deck, in the gym, or on an active shore excursion and pretty enough to help dress up an outfit for formal night. I’m an avid snorkeler, and will snorkel any chance I get. I book at least one snorkel excursion each trip, and do some beach snorkeling as well. 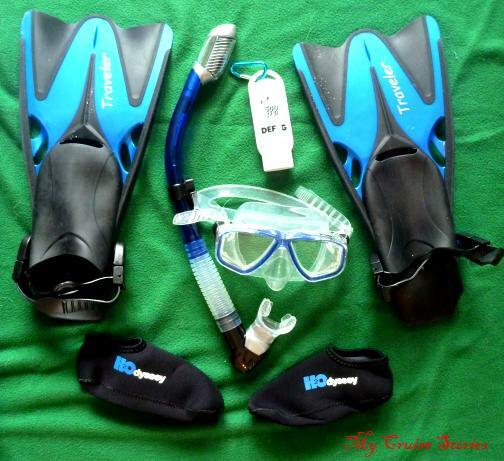 So for me it makes sense to bring snorkel gear even though it takes up quite a bit of space in my suitcase. Plus the only place I’ve ever seen dry snorkels with rental gear was in Hawaii. I like them much better and by bringing my own I get one. I’ve also added snorkel socks and mask de-fogger to my snorkel gear. 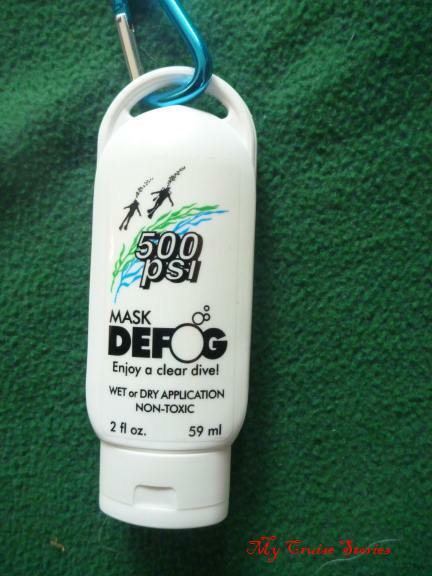 The mask de-fogger keeps it clear for good vision while snorkeling, and the snorkel socks protect my feet from getting sores from the rubbing of frequently-worn fins. This means I have to trade off that space for something else like fancy shoes though. Shoes also take up quite a bit of room so the 5 or 6 pairs I would like to bring is really not an option even without the snorkel gear, and bringing it means even less pairs of shoes will fit. I find beach shoes essential, a pair that can get sand, salt water, and chlorine from the pool or hot tub on it so I don’t ruin a good pair with that. Flip flops work for most people and don’t take up much space, but I never could stand having that bit of shoe between my toes. I end up with two pairs of sandals, one for beach shoes and one that I pretty much wear the rest of the time on the ship. People who do a lot of hiking on shore excursions may want to bring hiking boots, but unlike snorkel fins, you can wear those on the plane. Wearing your bulkiest shoes, clothes, and coat on the plane saves a lot of valuable space in the suitcase. Planes tend to be cold anyway, and you can always take the coat off if it isn’t needed. To really save room in the suitcase, layer up with a sweater or sweatshirt for the plane ride as well. One way to get more things on board the plane is to use a backpack for your personal item. It will hold whatever else you might have taken as a personal item such as a purse or computer, and quite a bit of other stuff as well. Just in case the airline looses your luggage you can put a few clothes in the backpack too. The backpack is also a good place for camera gear and a book to read along the way. I put my computer (which is a netbook so it’s pretty small) in the beach bag for protection, and then put that in the backpack. Plenty of room for my purse, all my travel documents, cameras, and whatever else I want close at hand, plus those extra clothes, and sometimes even a spare pair of shoes. Did I say I didn’t have room in my suitcase for fancy shoes? I do have a pair of slippers that looks enough like fancy shoes that nobody will notice they are not because who is going to spend the evening staring at my feet? That’s right, nobody. Since I don’t have to go outside or leave the ship or anything to get to dinner those work fine, they take up next to no suitcase space……and I can wear them as slippers too! Bonus – slippers are a whole lot more comfortable than high heels. So the point is pack what is most important for you and work around those items you just don’t have room for. The less space you have available, the more justification each item included needs – how much use will that item actually get? Would something else get used/worn more? Anyone who has enough clothes along the same color scheme that they will all mix and match can make more outfits out of less clothes by bringing all things that go together. Most people probably can’t mix and match everything, but the more things that you can the more variety of outfits you can get with less total clothes. A pair of travel pants (which you can get at places like REI) makes a good addition to the cruise ship wardrobe. Besides the fact that you get both shorts and pants in one garment, they work great for shore excursions. The secure pockets make a place for important things like your room card (which as anyone who has previously cruised knows is a necessity for getting back on board the ship). Some active excursions like zip-lining can mean you need a place to keep your things safe without carrying anything to put them in. Or perhaps you take an all-day excursion where it starts out a bit chilly, then heats up as the day goes on. How handy is it to just zip off those pant legs and have instant shorts? If you have room for a couple swimsuits it’s nice to have more than one. The ships all have pools and hot tubs and many have waterslides as well. Not to mention port stops with beaches. Putting one in that handy backpack not only saves suitcase space, but also insures you have it if the luggage did get lost. I’ve never had mine lost, but my husband once spent a week in the chilly wilds of Norway with no clean underwear and nothing to wear but the t-shirt, shorts, and sandals he wore on the plane because the airline lost his. Outlets in the cabin may be limited (we have at times had just one.) If you have a lot of electronic gear you want to plug in (computers, camera chargers etc.) a power strip helps out a lot. It’s also nice to have a portable hard drive – you can save each day’s pictures there so if your camera ever got lost or stolen you don’t lose them all. All of the ships have laundry service available (for a not exactly small fee.) Some of them, like Carnival, also have launderetts with quarter-operated washers and dryers. Sometimes quarters aren’t even necessary. On Carnival’s new Breeze, passengers just charge the washing to their Sail & Sign card like the rest of their onboard expenses. So it’s nice to know that if you can’t bring enough clothes for the entire journey you can at least get them washed. The showers have tiny little clotheslines if someone did need to do a bit of hand washing and didn’t have a wet swimsuit taking up the line. Cruise ships feed their passengers very well, so it might help to bring some gym clothes and make use of the exercise equipment to try and avoid going home with too many extra pounds. Anyone prone to motion sickness may want to include dramamine or another sea-sickness remedy along with any other medications they may need. Most ships do have something available, but who wants to go down to the desk and wait in line to get it when feeling queesy? 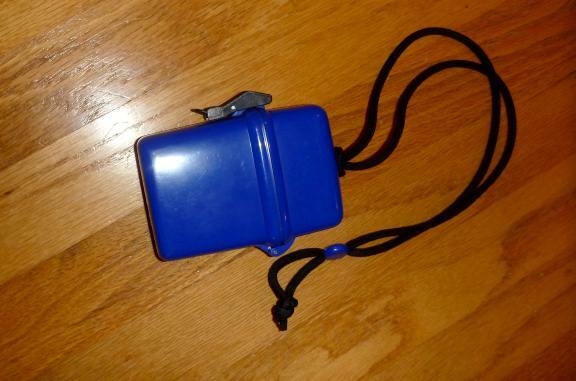 A waterproof case that you can wear around your neck to hold valuables like your room card comes in useful. Toiletries are pretty much a personal thing. Some people may be happy just to bring their toothbrush and deodorant and use whatever else the ship provides, while others practically need a whole suitcase just for the specific brands they prefer of hair and skin care supplies and their make-up. Be sure to leave a little room in the suitcase for souvenirs unless you plan to mail them (or your dirty laundry) home. And of course, don’t forget the really important stuff like your passport, cruise tickets and luggage tags! This entry was posted in Shipboard Life, Uncategorized and tagged cruise, limited luggage space, packing for a trip, packing light for airplanes, travel, what to pack for a cruise. Bookmark the permalink. This is great advise. I remember the one cruise I was ever lucky enough to go on. I think I probably packed my whole cupboard, not knowing what I was in for. Looking back, I could have packed a 10th and had just as good a time. I brought a lot I never used my first time too. There is one thing I never want to use when I pack it though and that is the rain gear. Great great post!!!! I have two cruises booked in my future (Southern Caribbean and the Baltics) and I thrilled with the idea of the slippers instead of shoes! I always felt that packing that pair of black dress shoes was a tremendous waste of space, considering I’d only wear them for a few hours total. 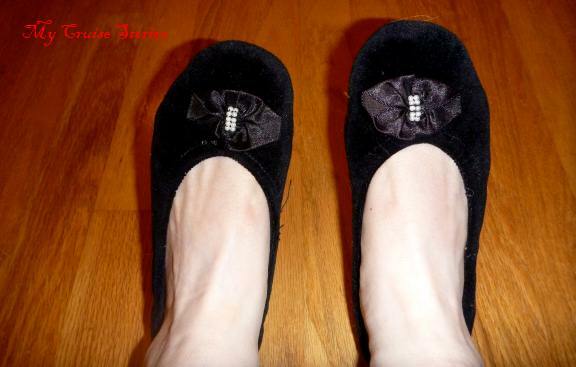 I’m going shopping this week for pretty black slippers! Awesome, thank you! My big plan (especially the Baltics cruise) is to pack lots of clothes that I don’t like, that don’t fit, or in other ways no longer suit me and I would have gotten rid of anyway. I’m going to wear those clothes (like you said, who’s looking? who cares.) 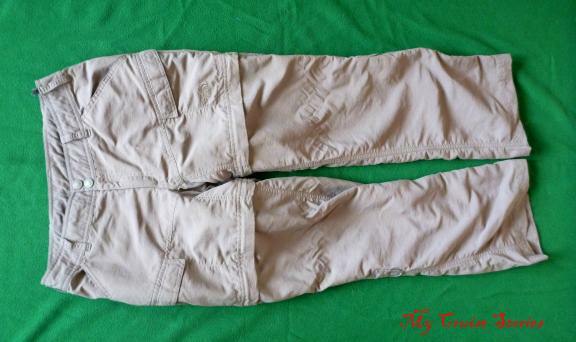 And after I wear them….. I’m throwing them away. So I won’t have tons of dirty laundry, but instead I’ll have lots of space for my shopping treasures!! Thanks again for the great post! Or maybe donate the clothes in a poor area? That is a very good idea for making suitcase space for all the treasures you find along the way. Great travel tips! I enjoy cruising and love to snorkel as well! Thanks. I love cruising and snorkeling too. There was one cruise where you passed up the snorkeling trip. I would have snorkeled in Alaska. There was an age limit, they would not have allowed Justin. Plus it poured down rain the day we went to Ketchikan. 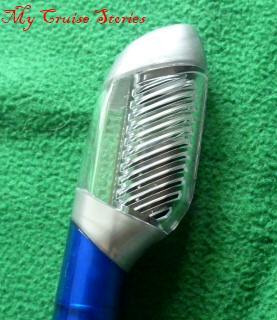 Any problem getting your Flexi clips through airport security, or did you check them? I wear a medium Flexi (LOVE THEM!) and am flying next week with only carry on. Mine were in a checked bag. They shouldn’t be any different than any other metal item in a carry on though.